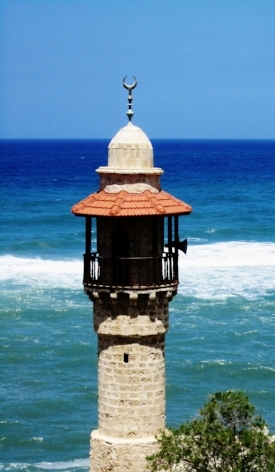 Jaffa is one the world’s oldest ports and only half an hour's walk from the centre of Tel Aviv. Usually one of the first things on a ‘must see’ list for visitors, there's good reason for it. With its winding alleyways, charming Artist’s Quarter and astonishing views of the Mediterranean, its hard not to fall in love with the place (which no doubt is part of the reason it’s undergone such an astonishing regeneration in the last 15 years). And if, like me, you’re a big fan of ‘getting lost’ then you couldn’t pick a better place to do it since Old Jaffa is a maze of narrow, winding backstreets). Jaffa (or Yafo in Hebrew) is quite possibly named after “Japhet’ - the son of Noah, who built the city after the Flood and is around 4,000 years old. The entire area is loaded with Biblical significance; in the Hebrew Bible, this is where Jonah attempted to flee from God by boat (eventually being swallowed by a whale), and in Christian scriptures it is where Saint Peter had a vision (on the rooftop of Simon the Tanner). A good place to start is at the iconic Clock Tower (built by the Ottomans in 1906). Head west towards the sea and “HaPisga ‘ - the Peak Garden. From here, you’re afforded fabulous views both of the Mediterranean sea and a long stretch of shore front, which is modern Tel Aviv. Walk past the Muhamadiya Mosque - not open to non-Muslims (unfortunately most of its beauty lies within walls). It’s at this point that you’ll spy Daniel Kafri’s marvellous “Statue of Faith” - on it are carved three historic Biblical scenes - the binding of Isaac, the Fall of Jericho and Jacob’s Ladder. Made from Galilee stone, and with a gate-like structure, it represents the “Gate of Entry” into the Promised Land, bringing to life stories of the three Patriarchs - Abraham, Isaac and Jacob. The pillars themselves are huge - over 4 metres each - and its size (and ‘strength’) convey to me as much as the intricate carvings themselves. Then head towards St. Peter’s Church - a truly distinctive building, with its bell tower and tall brick facade. Inside, enjoy the beauty of the marble walls, stained glass windows and vaulted ceiling. St Peter’s was designed in the style of European cathedrals, and built in 1654. It is open daily to the public and masses are held in several languages (including Polish). According to the Acts of the Apostles, this is where Peter raised Tabitha (one of the Disciples) from the dead. The fact that it’s located high on a hill means you get a bird’s eye view of the surrounding area - and a chance to catch your breath.